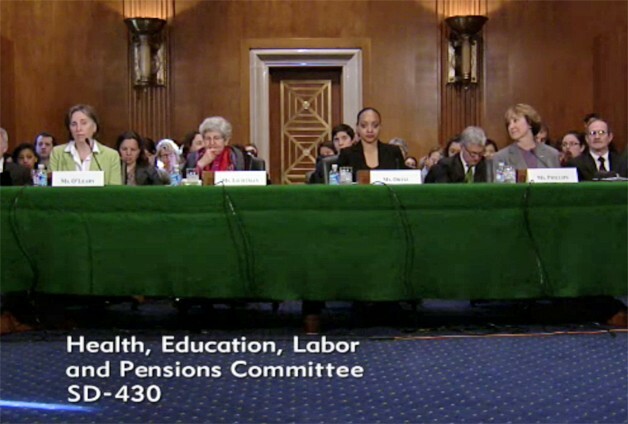 Kimberly Ortiz, third from left, testifies before Congress. A full-time employee at the Statue of Liberty for nearly five years, Ortiz still isn’t paid enough to support her family without food stamps. As it has done at least once a decade for the past 40 years, the media seems intent on pitting women against each other in a “Having it All” debate about work inside and outside the home. Author and organizer Ellen Bravo explains why the discussion defies reality. When Anne Marie Slaughter wrote her article for Atlantic magazine on “Why Women Still Can’t Have It All,” describing her decision to leave a top job for Hillary Clinton at the State Department, she acknowledged that she’s talking about a small sliver of elite women. “Millions of other working women face much more difficult life circumstances,” Slaughter noted. But neither Atlantic, nor the New York Times, nor any of the other major media outlets that has run or commented on Slaughter’s article, spotlight these working mothers—the majority, in fact—who are struggling with daily hardships because our country does not provide basic policies that help value families in the workplace. These women are not thinking about “having it all,” they’re worried about losing it all—their jobs, their children’s health, their families’ financial stability—because of the regular conflicts that arise between being a good employee and a responsible parent. What these women want are policies that let them be both without having to be superwomen.